When we think of ethical problems involving the nature of democracy in Africa, probably none is more paradigmatic than the issue of social justice. The linkage and interface between democracy and social justice in the continent remains such a heated subject. In a new book by American scholar Carol Gould that traces the social roots of global justice, Interactive Democracy (October 2014), we learn that these frictions have international dimensions and are as such a global problem. At the first instance this may appear simplistic, perhaps even strictly unnecessary, given the thousands of books already dedicated on the subject. However, upon scratching the ethical surface, it is in fact a very useful contribution. Barely a year since its publication, the book has already received the 2015 Joseph B. Gittler Prize from the American Philosophical Association. In Africa at the moment, there is an ongoing mediumistic hallucination in some government quarters with an extravagant appetite for political autocracy. This has triggered a critical public debate as to whether mandated power alternation ought to still be a crucial tenet of democracy, making Gould’s contribution timely indeed. In eastern Africa for instance, save for Tanzania that has a general election slated for 25th of October 2015 and Kenya some time in 2017, the entire region’s political leadership has consistently violated the concept of ‘term limits’ as a very basic yet crucial democratic tenet - contrary to what American political theorist Robert Dahl had observed in his 1961 classic Who Governs? The bone of contention revolving around rulers such as Yoweri Museveni of Uganda (in power since 1986); Paul Kagame of Rwanda (in power since 2003); Pirre Nkurunziza of Burundi (in power since 2005); Joseph Kabila (in power since 2001), ironically of “Democratic” Republic of Congo – to name but a few, is that democracy is a serious nuisance if not an outright inconvenience to the ‘big man’ whose interests are somehow served by a perpetually crippled Africa – an environment where the big man’s word is final. Arguably, such leaders remain a major but often neglected cause of the continent’s demise. Term limits aside, the struggle for democracy in Africa championed largely by civil society groups has managed to tease out the interconnectedness between politics and (in)justice by raising questions of human dignity, respect and sustainable human development. By recovering and uncovering the links in theory and practice between democracy, human rights, and social justice, Professor Gould’s book opens a gateway into these connections in a way that reclaims democracy by refreshing its emancipatory promises. For Gould, as for Aristotle, one of the godfathers of European philosophy, justice is a concept of complex structure within which we should distinguish a constant formal element and a varying material element. Drawing inspiration from earlier thinkers, including Emile Durkheim, Karl Marx, and Iris Young among others, Professor Gould advances what she calls the principle of "equal positive freedom" by incorporating it into human rights theory as a guiding normative perspective in the context of democracy and global justice. The principle, she argues, helps create balance between democratic participation at the local, national and international levels. Section one of the book lays out Gould’s integrative theoretical framework, and as the book progresses, its normative perspective is rooted in the fundamental recognition of “people's equality as agents"(see page 17). Agency we are told is the affirmation of one's “personal identity, or subjective existence, through concrete action in the world." With the introductory principle in view, human rights and democracy fall into place in an integrated theoretical framework, thus creating the justice claim to "equal positive freedom" that she had discussed earlier on (see page 3). 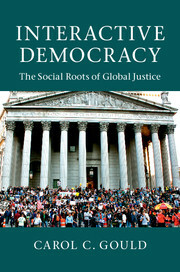 The second section of the book titled "The Social Roots of Global Justice” contains an extensive discussion of social and cultural realities and practices beyond the political aspects of human rights and justice, which connect abstract norms of global justice to concrete interactions and anchor normative principles in existing practices, and resistance to them. An impressively broad spectrum of issues unfolds in the chapters - from gender inequality to the sociality of humor. Among them, my favourite topic the discussion of ‘community solidarity’ is particularly valuable. Her discussion, corresponding to the outstanding work on restorative justice by the late Ugandan scholar Professor Dani Nabudere in his book Afrikology (2011), re-conceptualizes solidarity beyond a cohesive local and national community in terms of the supportive relations - given the interconnections that are being established through work or other economic ties, through participation in Internet forums and especially through social media, or indirectly through environmental impact (see page 99). She argues that these solidarities are important due to their potential contribution "to the emergence of more democratic forms of transnational interaction" and because they are a condition that enables the recognition of human rights as well as their fulfillment on a global scale (chapters 6 and 7). An immense advantage of this conceptualization of solidarities, in Gould’s view, is in its ability to make sense of how justice, democracy and the fulfillment of human rights might be advanced. She points out that it does not leave individuals, associations and social groups overwhelmed in the face of an impossible task, but rather helps break up a gigantic and highly complex struggle for human rights and global justice into interconnected parts. These parts seem to fall within the range of human possibilities, in as far a place as my wife’s village in Maua in Kenya to hectic New York, where Gould herself is a distinguished professor at the Hunter College, City University. The discussion of transnational solidarities in chapters 5 and 6 relates solidarity to the suffering of others and the ability to feel empathy with them. Transnational interactions urge the better off to recognize the suffering of the worse off parties to the interaction and take joint action to alleviate their suffering. Though in most cases the better off provide assistance to the worse off, solidarity is importantly seen a mutual process, with a reciprocal dimension. The provision of assistance is not a one-sided act of charity but is informed by the hypothesis that, were pertinent circumstances to arise, the aid would be reciprocated. Indeed, the wrongs that transnational solidarities seek to rectify are shaped, to an extent, by international and global structures and powers that bring about wellbeing for some and deprivation for others, the distributions of benefits and burdens are unfair and often arbitrary. Therefore, it is indeed important that the connection between the better and the worse off through structures of power is recognized and aid given under these circumstances is not seen as an act of benevolent altruism but as a mutual action urged by the interconnection (see page 116). The third section of the book draws on the discussion and insights from the first two parts of the book outlining the vision of "interactive democracy", where local, national, transnational and global modes of participation, decision-making, and deliberation interact. In this section, we find perceptive analyses and discussions of constitutive parts of a long-term and massive project of creating interactive democracy through an internal web of the International Labor Organization, for example. Conclusively, with careful optimism Professor Gould’s book makes a compelling case that there is room for progressive social movements, civil society associations, and ordinary citizens that rise against oppression, repression and dire inequality even in the darkest corners of Africa. Although it is anachronistic to point out that the colonized mindset in Africa is still a major factor impeding democratic development concerns, the stark reality is that since independence, African states focused policies at addressing economic obstacles to development and deliberately ignored or disregarded ideas about the need to create autonomous spaces in public discourses. Sadly, today in Africa degrading and outdated stereo-types are still dominant in public policy discussions to which elected leaders, civil servants, political commentators, and even community activists themselves subscribe and at times even contribute. On the scale of things, Gould is hopeful that the increased new forms of cultural creativity and interconnections facilitated by communications technologies and cooperation that communities across the world have a reason to start counting the ‘big man’s days.